Hotels in Russia are expensive, I recommend looking for a good value apartment on airbnb. Although Moscow is a huge city, most of the points of interest are very close to the Red Square, which has it’s own metro station (Ploshchad Revolyutsii) in case you are not staying within walking distance. 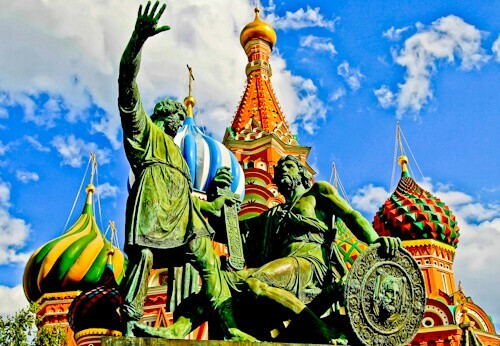 The statue in front of Saint Basil’s Cathedral is the Monument to Minin and Pozharsky (above) who put an end to the Time of Troubles in 1612. Russia is famous for its ballet and the place to watch the ballet is Bolshoi Theater. Check the schedule before going to see if there is anything of interest on. If you don’t like the ballet, Bolshoi Theater is still a beautiful building to photograph. Adjacent to the Red Square is Alexander Garden which gives some stunning viewpoints of the Kremlin, Nikolskaya Tower and Saint Basil’s Cathedral. There is a lot to see in the Kremlin territory so check the Kremlin website for opening times to see if you can visit on your trip. Almost underneath the Nikolskaya Tower is the Tomb of the Unknown Soldier which is a monument honoring Soviet soldiers lost during World War II (above). Around the corner from the Tomb of the Unknown Soldier is the Lenin Mausoleum. 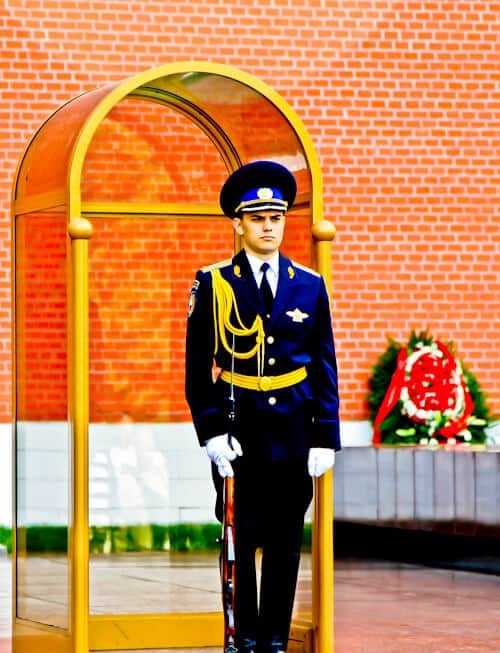 To visit the Mausoleum of Vladimir Lenin situated in front of the Kremlin you must go Tuesday, Wednesday, Thursday or Saturday from 10 am to 1 pm. Moscow can get very hot during the summer and cold during the winter, on Red Square is the GUM shopping mall which is the perfect place to escape the weather. 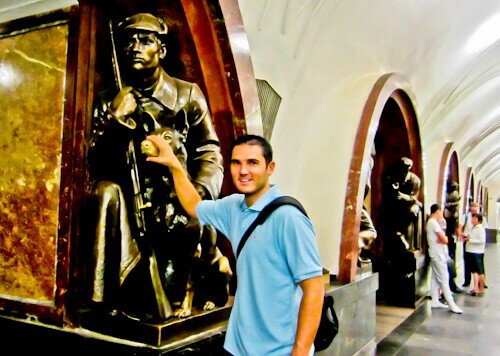 Ploshchad Revolyutsii metro station is full of bronze statues and is worth a visit even if you have no plan to take the metro. It’s believed by the people of Moscow that if you touch the dogs nose then you’ll receive good luck (above). Where could you go on the Metro? You can take the metro to the tallest building in Europe, the Federation Tower. Other landmarks a metro ride away are the Moscow Zoo, VDNKh, Kolomenskoye museum or Sparrow Hills (and view of the city). After the Kremlin, Red Square and Saint Basil’s Cathedral, I found the Cathedral of Christ the Saviour to be the next most beautiful site. The Cathedral of Christ the Saviour is located a short walk from the Red Square and is slightly raised so you can make some good city photos from here too. Visiting this cathedral gives you bragging rights to have visited the tallest Christian Orthodox Church in the world. The train from Moscow to Irkutsk in Siberia, Eastern Russia takes 4 nights, travels 4200 km and crosses over 5 time zones. Although I am traveling to Irkutsk, the train will continue as far as Vladivostok which would take 7 nights and cross 7 time zones. There are 3 different classes on the Trans Siberian, 1st, 2nd and 3rd class. The main difference between the classes is the number of beds, ranging from 54 per carriage on 3rd class to 18 per carriage on 1st class. I traveled to Irkutsk in the 1st class carriage which has 2 beds per compartment and 9 compartments per carriage. On the first class carriage there is a shower but I must confess I did not shower for the whole 4 nights on the train. There’s free hot water available 24 hours a day, so you can bring your own tea, coffee and noodles. When the train stops at stations you can jump off and quickly buy food but you never really know how long the train will stop for so this is a bit risky. There is a dining car, which provides 3 meals per day. I was lucky enough to be traveling with an old Russian lady who was keen to feed me the whole trip so I did not have to worry about food. Each carriage has it’s own provodnik (steward), who keep the carriage clean and in order. I would not have risked upsetting the provodnitsa (female steward) on my carriage (above), she was pretty fierce looking! What an awesome photo diary!!! I can’t wait to visit London this fall. Glad you had an awesome vacation!!! Ahhh I love this! My family is from Russia and escaped in the early 1900s from religious persecution. I am dying to go back with my cousins who still speak Russian. I didn’t realize that Russia was so well connected by the railway! Guess I’ll need to hit a few places when we go! Your photos are stunning! Red Square is on my wish list for more than 10 years and even though Moscow is an amazing city people still feel stupid question, that is it safe? Could you also share the cost of ticket of Siberian Train? 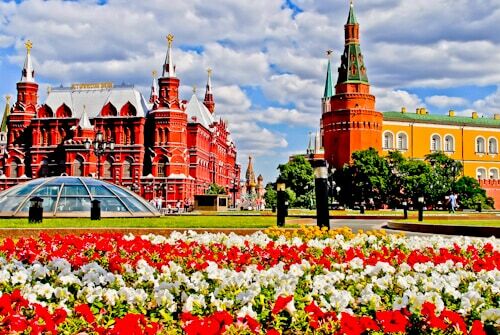 Moscow is one of my dream destinations, hopefully it happens soon. The rough itinerary you have presented has good list of must sees.I read else where too that hotels there are expensive. Thanks for your suggestion of air bnb.I didn’t know about the different classes in Trans Siberian. Very informative post., Thanks! Moscow looks like such an interesting city. A friend of mine has experienced the Trans Siberian railway. It sure is one of its kind. I love all the beautiful and vibrant colors in Russian architecture! Your photos make me feel like I was there! Wow! Looks like you had a great time! I would love to visit Russia one day. wow! Russia. How did you feel? I guess with all the tension with the US and Russia, I would be a bit scared to go. But all looks lovely. Gorgeous. 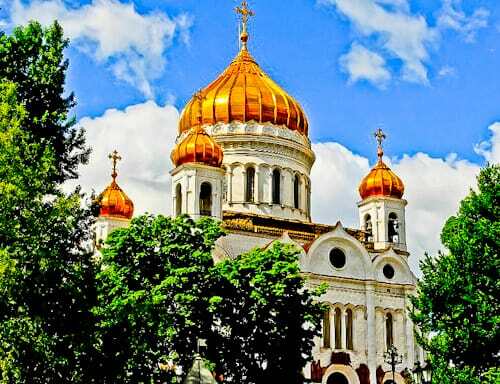 Those colorful domes of the Moscow churches always reminds me of Aladin & Jasmine! Going all the way to Russia, a ballet shouldn’t be missed! A train that runs for 4 nights over 5 timezones??? Whoa! That’s something!!! I’d like to book a trip on the Trans-Siberian railway too. I read that it is the longest journey that anyone could take. It would be wonderful to see the Russian landscapes while traveling on the train. Beautiful photographs with vibrant colors – nicely done! These pics make it easy for readers like me to envision your experience in Russia. Wow! Such a beautiful city! I had no idea it was so colorful there and your pictures are fantastic! I never thought of going to Russia on vacation it looks amazing! Do you have to know the language to travel there? Yes, it will help you a lot if you learn some Russian before going. I learnt quite a lot of Russian before going, I learnt how to read Russian as well which came in very useful on the metro! Moscow and the Trans siberian is on my bucketlist. Who can forget the Kremlin being blown up in Mission Impossible? I would definitely love to see a ballet in Russia. All the pictures are so colorful. That’s a very helpful comprehensive list of places to visit in Moscow. Your photographs are great and tempt me to book my tickets to Moscow right-away. Few of your tips will be really helpful. Thanks for sharing. I wish I was more able to travel. Your photos are amazing, thank you for sharing. Travelling through Russia in trans-Siberian railway is one of my dreams. Very informative post. Amazing pictures. Beautiful photographs! I would love to travel to Russia to take photographs and experience the culture. Russia is in my list of places to visit so these tips are really helpful for me. I didn’t know that hotels in Russia are expensive so I will definitely look into an airbnb. Great list of itinerary! I hope we could cover all of these when we get to visit Russia! This is an amazing post! Great information and awesome photos! Maybe one day I’ll visit Russia! Russia is still on my bucket list. Fingers crossed for a trip in 2018. Thanks for sharing your adventure! Sipping tea on the Trans Siberian railways sounds like a trip back in time. I’ve always wanted to take the Trans-Siberian railway! Thanks for sharing such great tips. Must be a fun trip. That is my homeland. Let me know if you need any help, I am bilingual @ehesketh on my twitter or FB – I can help with Russian. I have never been to Irkutsk, but have some friends from there. This sounds like a great adventure! On my bucket list now. Moscow is on my bucket list. Unfortunately, never ever had the opportunity to visit it. The pictures look so amazing!! I have to admit , prior to reading your post, I had never considered vising Moscow. But you have done such a great job describing all the things to do and points of interest, I may just have to add it to my bucket list of places to visit!! Your photo shots were great!! What an adventure! I’ve been to St Peterburg and I absolutely loved it! If Moscow is anything like I experienced, I’d love to go to Russia again! The train ride is on my bucket list too! How much did you pay for the 1st class tickets? I love travelling by train, I find it such a great way to explore a country, and it’s often a bit of an adventure in itself!! Awesome train route itinerary. Always love the romance of trains. The Trans-Siberian Railway is an iconic one and this surely is an epic train journey. Hope to get onto this train some day. I definitely want to visit Russia so thanks for the tips with regard to hotels and photography! Love the sound of your train journey, is there much of a difference in cost between the classes (I only ask because you mentioned the hotels are expensive). What a fabulous experience you had! Russia has an aura of other-worldly grandeur that is hard to beat. Larger than life palaces and museums…would love to check them all out. Its on our list. This is one of my top train journeys to take! We had wanted to go to Australia this summer (or as far as possible) overland but time and visas are not on our side! Will look forward to reading more! You are traveling the way I dream of! Looks like you had an amazing time – the Trans-Siberian is something I have always wanted to do – would be an absolutely incredible journey! I want to explore Moscow properly as well – I have been there twice as a kid but I don’t remember it very well! The metro is beautiful though! I think Russia and particularly Moscow is underrated. I have always wanted to see St. Basils cathedral. Thank you for sharing the other sites as I now want to visit those as well. Really useful guide to Moscow. We would like to do more train travel, an interesting way to travel, though would be a nightmare if you did get off and the train went on! Great post. Great guide and tips, we’re desperate to visit Moscow, seeing Saint Basils Cathedral and visiting the Red Square are high on our list. We’re hoping to do the Trans-Mongolian someday in the future, thanks for your sharing recommendations for Moscow will keep them in mind when we finally make it there. Russian architecture is just beautiful! And traveling on the Trans Siberian Railway has been something we’ve long thought would be an amazing trip! It sounds like Moscow is a great starting point for your Trans Siberian train trip. Moscow is huge as you say with so much to see. I hope you will enjoy the rest of your journey. Some great historical points of interest in Moscow. The Saint Basil’s Cathedral is absolutely stunning from your photo. I always love your curated shots along your travels. Thanks for sharing your tips. I will be sure to look into AirBNB if I make it out to Moscow. I hope the dog’s nose worked in the luck department for you! Looking forward to your pics of UB next week. Saint Basil’s Cathedral looks gorgeous! I’d love to see that in person! I bet my kids would love to travel on the Trans-Siberian Railway someday! St. Basil’s Cathedral is one of the top destinations on my bucketlist! Look at the swirl of colors! Good to know that airbnb is the route to go in Russia 😉 I’ll keep that in mind! Russia looks amazing and it is one of the places that we will be visiting at some point on our travels. Great post. Trans Siberian train trip sounds so interesting to me and I enjoy reading about people who have experienced it. Hopefully someday that will be me! I would also love to visit Moscow someday. I did go to St. Petersburg view years ago and there was much to see! What an experience! I’ve always wanted to ride the Trans Siberian railway, it sounds like an adventure from your post. I also love your photos of Moscow, they’re so vibrant! I visited St. Petersburg, but I’m excited to get to Moscow to see some of this famous architecture. This trip looks truly amazing! So much history in Moscow, would love to visit. The Cathedral sure does look like a Disney castle, doesn’t it? Glad you were able to capture it with the right light. I think the Trans Siberian railway would be quite an adventure one day. Wow this is great very thoughtful and detailed read about Moscow. I’d like to experience riding the Siberian railway and would love to see Saint Basil’s Cathedral and the Cathedral of Christ the Saviour in person. They look beautiful. Thanks for the great read. Moscow looks so great! I have always wanted to explore Russia. I love taking a train in countries which I do not speak the language. I would love your train journey. Thanks for such an informative post. What an amazing time you must have had. The pictures of the Cathedral are beautiful. I think it requires a lot of patience to travel in a train for 4 nights. I always have many plans to visit Russia for its special styled architecture and colorful buildings. Your pictures of St. Basil’s Cathedral and Alexander Garden tempts me to book tickets now. Travelling through Siberian rail must be fun as it has other basic facilities of 24 hours of hot water for basic needs.